The Koreatown Pavilion Garden, Da Wool Jung, is Koreatown's gateway monument symbolizing the cultural, economic, and political growth of the Korean American community. The Koreatown neighborhood of Los Angeles, California, (population 100,000) dates to 1904, when the first Korean arrived in the city. The first Koreans who settled in Los Angeles were farm laborers and railroad workers. The early Korean population concentrated in the poor, working class neighborhood of Bunker Hill. As the number of immigrants increased throughout the 1930s, the community shifted westward along Jefferson Boulevard, which became the center for Koreans in the United States. The Immigration Act of 1965 enabled a new cluster of Korean immigrants to establish businesses, churches, and homes further west into the area of present day Koreatown. Korean grocery stores, banks, restaurants, doctors' offices, cafes, and nightclubs continued to develop in the area. 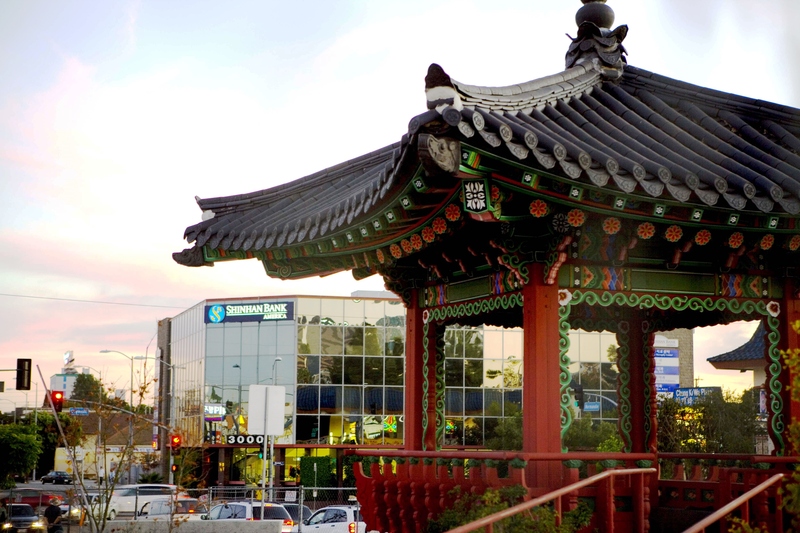 Today, Koreatown encompasses more than two square miles just west of downtown Los Angeles and continues to have the highest concentration of Koreans in the United States and outside the Korean Peninsula. The Koreatown Pavilion Garden, Da Wool Jung, is located in the heart of Koreatown, and was dedicated in 2006. The 5,000 square foot pavilion is located across the street from the location of the first Korean grocery store, opened in the 1960s. Made of pine and dyed in traditional shades of green, rust, and red, the open-air pavilion is topped by an upswept tiled roof and contains a seating area open to the public. The project was initiated by the Korean American Chamber of Commerce and funded by private and public funds. The site was provided by the city of Los Angeles. Da Wool Jung is Koreatown's gateway monument to symbolize the cultural, economic, and political growth of the Korean American community. The Korean Organizations Association is a non-profit group formed by five community-based non-profit organizations. The five member groups are housed in a central building, which allows them to develop and operate a cultural and community center for the Koreatown community. The Korean American Museum and the Koreatown Youth and Community Center are among the organizations housed in the building. The Korean American Museum is dedicated to exploring the Korean American experience, in addition to fostering creative approaches to advancing Korean American culture. The museum's exhibits look at different aspects of Korean American life throughout the United States. For more than 35 years, the Los Angeles Korean Festival has provided an opportunity to celebrate one of the more than 200 ethnic communities that work and reside in the Los Angeles area. The festival also celebrates the Korean Thanksgiving, the Harvest Moon. The festival and parade draw more than 350,000 Los Angeles residents a year.